Riley’s first memory is a happy one – her eyes open, and she sees her father smiling at her. The memory is recorded and stored in her mind. Years later, as an eleven year old, Riley’s mind is filled with memories, most of which are happy. Her memories (and her actions) are governed by five emotions that live inside her – Joy, Sadness, Disgust, Anger, and Fear. Everything has been going smoothly until her parents decide to move. Riley leaves behind the Minnesota live she loves and moves to San Francisco where she must make new friends and acclimate to a new culture. It’s hard, and her emotions have a hard time coping. Throughout the months ahead, her emotions try to find themselves, and restore balance – and along the way, they try to figure out what purpose there is to Riley even having Sadness at all. The short film that plays before inside out, Lava, is a story of a volcano longing for a companion. Will his dreams come true? While Riley does stay with her parents, she is moved from a familiar environment into a new, foreign, and uncomfortable one. The move is a very hard one for her, and for a time it looks as though she has lost her joy – and even her personality. Kids who have been in foster care may relate to her experience and how it impacts her. I’m also hopeful that adults who serve as foster or foster-adoptive parents might find the movie as a helpful way of conceptualizing what’s going on when their kid acts out. Most behaviors do make sense within at least one context, and Inside Out invites us to meet the context in which they make sense. 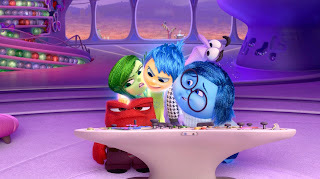 Inside Out is fun and imaginative enough to appeal to even young viewers, but intelligent, thoughtful, and psychologically sound enough to be meaningful and helpful and relevant to a broad range of viewers. The movie offers a very interesting perspective on what makes us who we are. Then, Riley’s world is shaken by her move. That all happens before the title scene. Inside Out doesn’t waste any time. Maybe it’s because of what I do for a living, but I’m fascinated by the thought of knowing what’s going on in other people’s minds and seeing the world through their own eyes. 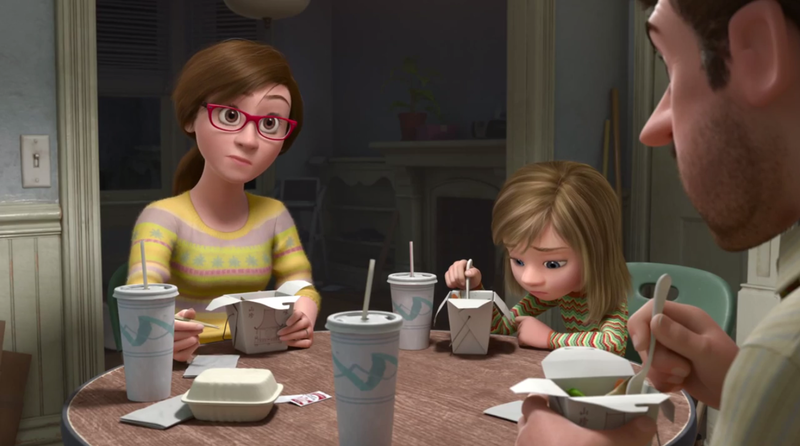 I could see young viewers coming away from Inside Out with a sense of feeling understood, understanding themselves, and also developing an interest in empathizing with others. Inside Out shows that there are valid purposes for all of our emotions. It’s helpful for kids to know that no emotions are inherently bad. Riley does something that most parents would call “very bad” (SPOILER: she tries to run away). Her parents don’t respond with anger, but with love, concern, and understanding. They don’t punish her, because they understand where she was coming from. 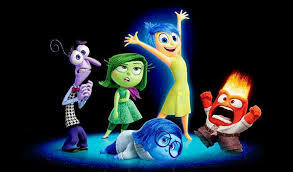 I love how this film shows the reasons and emotions behind behavior. My hope is that parents and perhaps especially foster parents focus on understanding behavior, rather than simply trying to modify it. Mercifully, the film also lets us into the minds of Riley’s parents – parental responses to kids’ behaviors are also driven by emotions. We’re able to have grace for our kids and for ourselves when we understand that. Riley’s mom puts some unfair weight on Riley, asking her to “keep smiling” so that Dad won’t be stressed or sad. 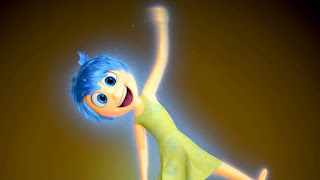 By the end of the film, though, Riley is able to express her feelings to her parents, and they’re able to accept them. My only caution here would be to make sure that kids don’t take the “keep smiling to help your parents” as the film’s actual message, but a quick word from parents after the movie can probably avoid that misunderstanding. There are some sad points where it looks like Riley is losing aspects of herself that are very important to her. I heard at least one kid in the theater crying. I didn't see any weak points. This is the best movie I’ve seen this year. It’s fun, engaging, psychologically sound, and therapeutically useful. It is fun and engaging, so it will entertain even quite young viewers, but it seems likely to be helpful to any families that want to be able to think about, or talk about, emotions. 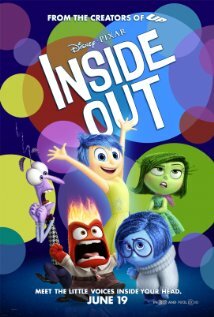 Inside Out gets a very rare universal recommendation from Adoption at the Movies – good for ages 3 all the way up to adults. Well done, Disney and Pixar. By the way, I always stick around until the end of the credits. This is the first movie that the entire theater stuck around, and gave the movie two rounds of applause – first after the film ended, and again after the credits. I haven’t experienced a movie being appreciated in that way before. What do you think is the purpose of sadness? Which emotions are strongest in you? What if you could choose your dreams? In Big Hero 6 (which won Best Movie in the 2015 Adoption at the Movies Awards), Baymax sacrifices himself to save others. A similar theme is in this film. Click here for the Adoption Movie Review of Big Hero 6. Click here for the 2015 Adoption at the Movies Awards. Riley’s memories are stored in a bank. A similar concept is in Rise of the Guardians. Rise of the Guardians also creatively expressed that there’s more to people than what you see on the surface. It used nesting dolls to accomplish that. Click here for the Adoption Movie Review of Rise of the Guardians. Joy and Sadness walk through a labyrinth in Riley’s mind which is at least visually similar to the labyrinth in The Maze Runner. Click here for the Adoption Movie Review of The Maze Runner. It’s a sweet story that gives us a little insight on how childhood memories are shaped and also how they can be lost. Thanks, Thomas. You're right - this is an insightful, touching film! Wow - I hadn't thought of that, but your first point is pretty compelling. I wonder if that's something Pixar intended to convey! This is a serious movie to teach us about our emotions. I enjoyed it. The thought occurred to me as to what someone that had no idea of what they were getting into might take away from it, especially younger children. If you had no preparation you might be somewhat confused. It takes a while to catch on that the main characters are the emotions. There's a brief period at the beginning where they introduce the emotions and their purpose but that goes by pretty quickly. The theoretical content is fairly divided between how memory is processed, stored and lost and the real-time purpose of emotion. From my point of view of someone that has studied the psychology that is the basis for this movie which is the work of Silvan Tomkins’ work, much is left out concerning what we know about the full set of emotions. Paul Ekman one of the main theoretical contributors to the movie gives Tomkins credit for his career yet modified Tomkins’ work. Also she , Disgust ,explains herself much in terms of dissmell saying she saved “us,” meaning the child, from being poisoned by broccoli but that is the role of dissmell as the child initially never takes in the broccoli. Immediately after she is tricked into eating it but does not reject it in disgust. Sadness will probably be one of everyone's favorite characters. Eckman sees shame, a center piece of Tomkins work, as a form of sadness and you see that in this portrayal. Many facets of shame come through. 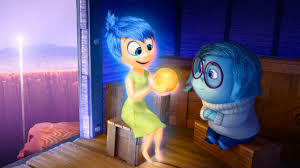 I think the way they portray Sadness and Joy interacting could be useful in teaching about shame. I like the use of the blue and the gold to signify Sadness (shame) and Joy. Time will only tell how influential the movie will be. All in all the movie should go a long way in at least generating some basic conversation. Hi Brian! Thanks for this very informed reaction to the film! What are some other films that you've found interesting from a psychological perspective? LOVE LOVE LOVE this movie! My sons and I watched it twice and it was just as good as the first time! My son even drew a picture of them he loved it so much. Our family had great experiences with this movie. One of our adopted kiddos literally told us that they felt like the conversations the characters were engaged in were how it played out in their own head in reality. It was great to be able to talk with our kids about how emotions such as sadness and anger can be healthy. We are not designed to be happy all the time. It also led to good talks about how to positively handle our sadness and anger. Some of our kids aligned with the characters so well that there were tears spilt. I will say that my wife and I were leaking eyes as we watched also. Great movie. Wow, Darren! Thanks for your comment! I'm glad you guys loved it so much! And you're right, we're not designed to be happy all the time; or even if we are - it wouldn't make sense in a world where sad things happen! A time for everything, right :)? I love your little empathy video, and your reference to the Biblical concept of crying with others and laughing with others. Ever heard the song by Jason Gray "Not Right Now"? Very poignant lyrics that are about this very thing. We live in Africa and so are very rarely (OK, never!) on the cutting edge of movies, but the advantage is we get to have so many opinions before we even think about seeing it! Inside Out is one we've held off on, our two kids are both adopted and are both living with us as we serve as missionaries. It's been really hard to leave America and come here, on so many levels, so we just haven't felt ready to jump into this movie yet. Our kids are 4 and 5, so we thought maybe a bit older we could have more valuable processing? Thanks for this site! Hi! Thanks so much for your comment. I'm glad you liked the Bible connection, and Brene Brown's empathy video. I haven't heard Jason Gray's song, but I'll give it a listen. You know your kids better than anyone, so for better or worse (I think better!) you and your husband get to make the call on how old they are when they meet Riley and her emotions. I could imagine parents being able to help young kids use the film to talk about emotions, but I also think you're right that the older the kids are, the deeper conversations they'll be able to have, and the more real-life experiences they'll have to relate their emotions to. It's a really well-done film, by the way, and I imagine most parents will like it, too. Thanks so much for reading, all the way from Africa. God bless you guys. My 6 year old adopted son loved this film. We are still new as a family and he is still learning the depth and meaning of emotions and how to convey his feelings accurately. During one evening when he was feeling particularly bad about something, he referred to his world as falling apart and, after some questioning, I realised he was referencing the islands in the film and how they crumbled when Riley made choices that didn't fit with the integrity of each island. It was a massive breakthrough that he had an image he could portray to me and that I could understand what he was referencing. It was then hugely helpful that we could discuss how new islands were then built and new memories as a family would be made to help build the islands again. Such powerful imagery in this film that I am sure we will be able to refer to time and again. I recommend it to anyone looking fir ways to help explain big feelings to children and how they can work together. Hi Tanya! Thanks so much for commenting. I'm glad your son liked Inside Out - and it's especially interesting how the film has provided a language (or rather, concepts) for him to use to talk about his own feelings. I think films are such powerful bridges into important conversations; that's actually why I started this website :) I'm so glad you commented, and I'm so glad you're here. Your son is fortunate that you're so invested in helping him talk about his feelings! Hi Addison, in this movie there is evidence to show that Riley may have been adopted. Thanks P-J. I'd heard that theory before; I wonder whether the filmmakers intended it?